I’ve been building some “foreign” stock for the goods depot at Farthing. It’s a real pleasure, but also humbling to realize just how little I know about other companies, and how difficult it can be to obtain kit parts for other pre-grouping companies. We GWR modellers are a spoilt lot! My 1900s period is before the “common user” arrangement, so most of the goods stock at Farthing would have been the GWR’s own - but there should be room for a handful of foreign vehicles, especially from the companies close by. This included the MSJWR, which crossed the GWR's Berks & Hants line at Savernake, not far from Farthing. 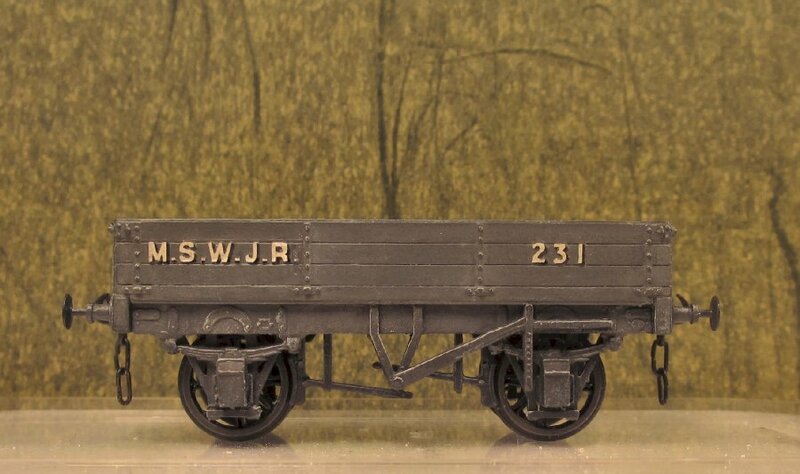 So first up was a MSWJR 3-plank dropside wagon. Over on gwr.org.uk I had seen a note by Paul Absalom that this could be made by modifying a Slater’s kit for the Midland Railway dia 305 (thanks Paul!). 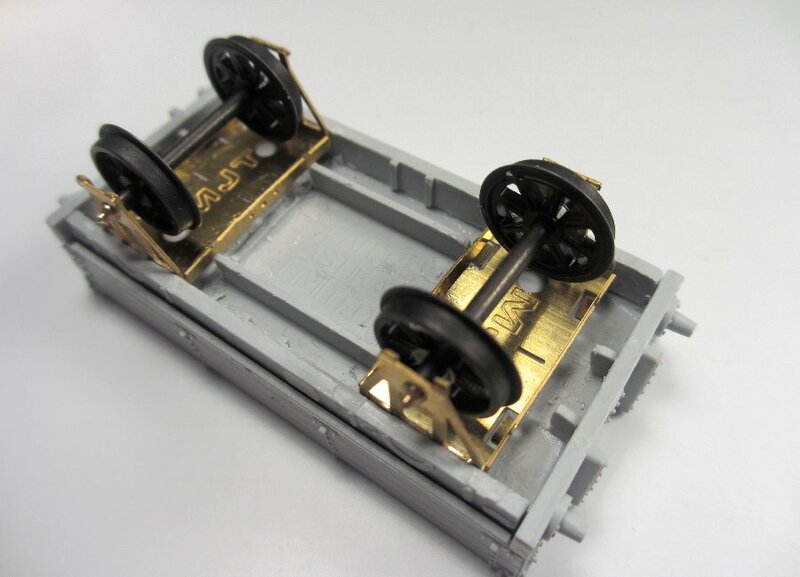 The MR design was used as the basis for 20 wagons ordered by the MSWJR from Oldbury works in 1899.The sides and ends of the Slater’s kit (above) are virtually identical to the MSWJR versions, so these were used directly. The running gear is a less straightforward matter. 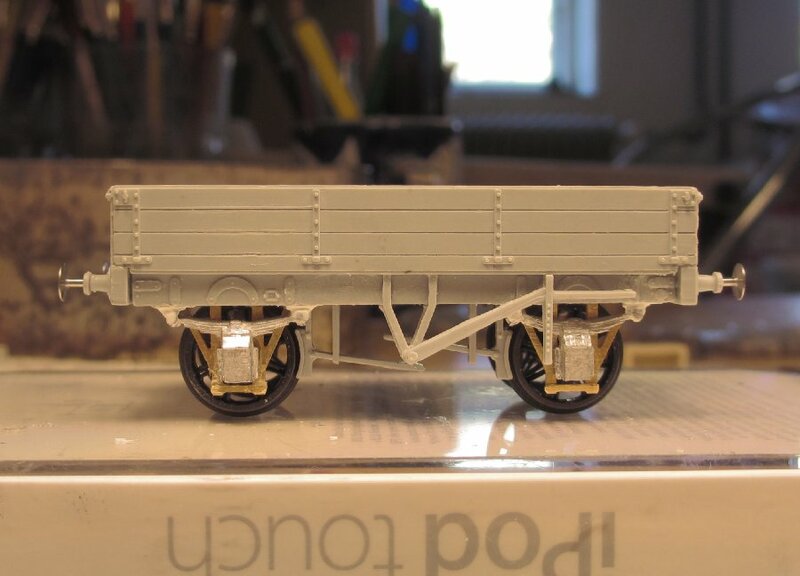 There is very limited documentation available on these wagons, and the only known photo has the underframe in shadow. A drawing has been made, but there is doubt about whether the running gear is portrayed correctly. So an informed guess is the best we can do. This led to an interesting discussion involving several RM Webbers – especially wagonman – as well as Neil Lover of the “Swindon’s other Railway” site and MSWJR historian Mike Barnsley (see this thread for details). Many thanks, gentlemen! 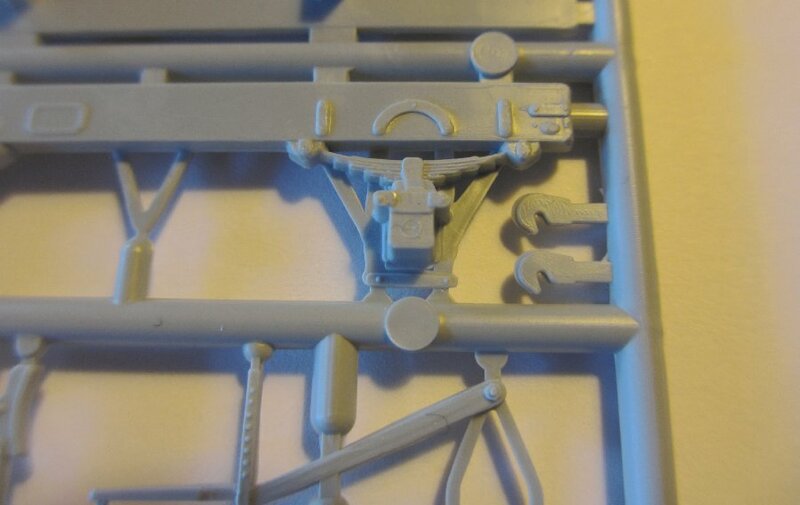 To cut a long story short, we concluded that the MSWJR probably wouldn’t have gone for the fairly sophisticated and expensive Ellis axleboxes provided in the Slaters kit. So these had to go. An alternative option would have been to modify the existing axleboxes. 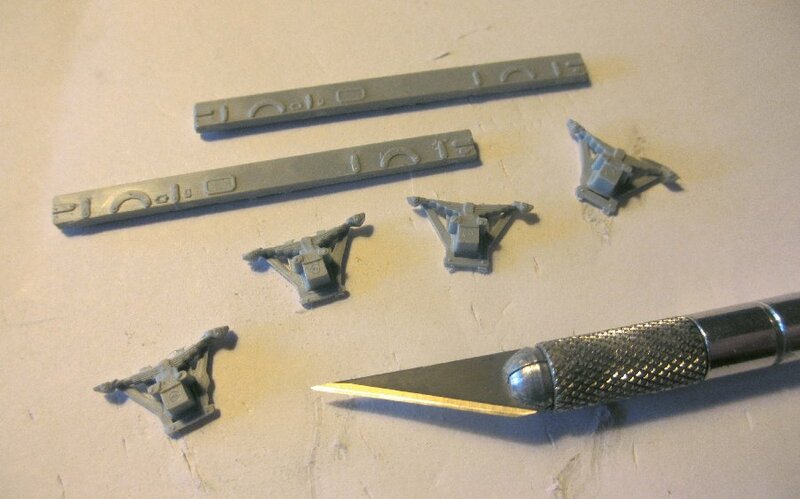 Instead I fitted MJT units/W-irons (non-rocking). This required some of the framing to be carved away, but was otherwise straightforward. Packing was added underneath the units. The exact type of axleboxes used by the MSWJR isn’t known, except that they were most likely of the grease type. In photos of other MSWJR wagons I noticed a simple type not unlike the standard GWR grease box. So I fitted some of the latter (also from MJT) and modified/filed them to suit. The only other modification was to file away the MR build plate on the solebar. I couldn’t find any ready-made MSWJR lettering, so opted instead for the “white shaded black” letters from one of the HMRS P.O. sheets. These are slightly overscale but close enough, I think. 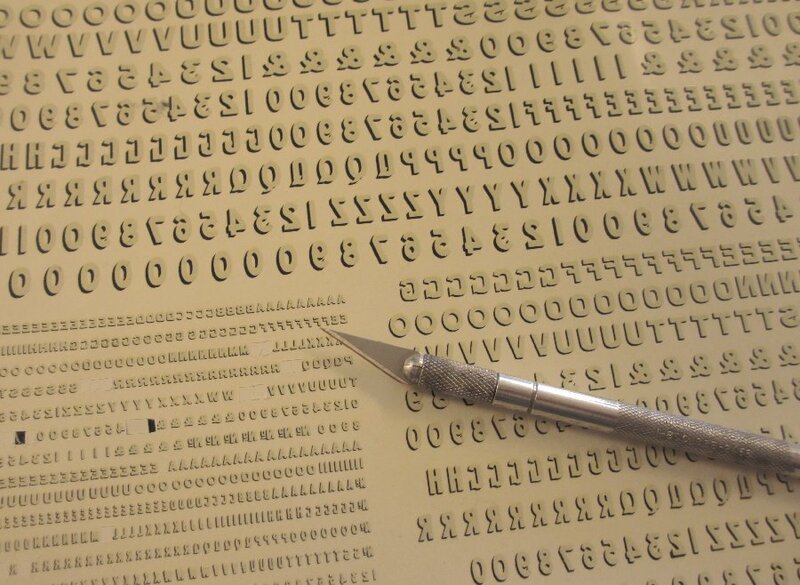 The sheet is rather costly, but I wanted it anyway for lettering some Farthing based P.O. wagons at some point. The finished model. I suddenly realized that a dropside wagon might not often be seen inside a goods depot, as they tended to carry loose material, stone etc. But I’m thinking that a couple of large crates might justify a dropside, to facilitate unloading? Shunter George “Bulldog” Mullins studiously ignores the new wagon. A GWR man to the core, Mullins treated vehicles from the competition with poorly disguised contempt. In particular, he refused point blank to shunt vehicles from the MSWJR. The origin of this particular grudge was always a bit of a mystery, although some said it had to do with an unfortunate incident in his youth. The details were unclear, but apparently it involved his pet donkey, a sleepy MSWJR driver and a poorly guarded level crossing. Great modelling as usual Mikkel and I love Shunter Mullins back story! I've always had a soft spot for the MSWJR and considered modelling it for a while, but like Mr Mullins I'm a confirmed GWR man. I grew up living about half a mile from the MSWJR line about half way between South Cerney and Cricklade. The track had long been lifted, but I spent many happy hours walking my dog along the track bed. You're on a slippery slope, Mikkel. Next thing is that the M&SW will get running powers from Swindon, through Farthing, to Salisbury and all sorts of strange things will start to appear. A lovely job on the wagon as always good sir! Hello Dave, those walks sound very nice! Hello Mike, I know exactly what you mean. In fact I already have more non-GWR wagon kits on my desk than I need. Mullins won't like it! Thanks Castle. The Slaters MR kits are very useful because of that company's connection to the MSWJR and especially the SDJR. 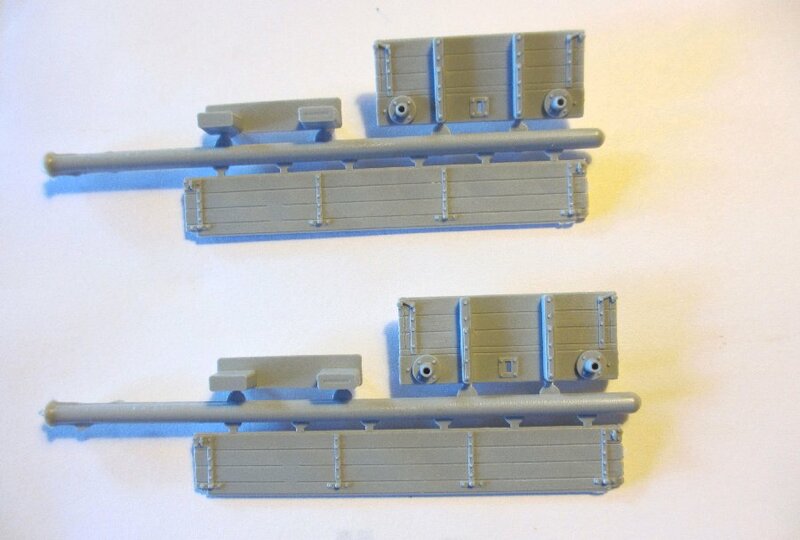 Got a couple of modified wagons for the latter in the pipeline. Do you think the Donkey got "splatted"?? Yes, it does look as if the donkey got hit. In fact, the story goes that Mullins' father, upon hearing the tragic news, went directly to the MSWJR HQ and demanded compensation - the size of which corresponded more to the cost of 2 Arabian stallions than a scraggy donkey. Shocked at the demanded amount, the MSWJR lawyer sought first to settle for something more reasonable, but eventually gave in when confronted with the wailing Mullins Junior, his scowling father and the thought of bad publicity. This of course did nothing to soothe the heartbroken young Mullins, whose troubles got worse when it was discovered that the dead donkey had mysteriously disappeared from the scene of the accident. Rumour had it that the local crossing keeper, being a practical man, had secured himself dinner for the next two weeks. I always enjoy your blog. Keep up the good work. I have scoured the literature but can find no recipe for Donkey Steaks... not even in Mrs. Beaton! Looking forward to see more "foreign" goods stock. Thankyou Gareth. Encouragement is needed as I managed to crush the mezzanine floor in my goods depot last night! Almost gave up on it but this morning has seen about half of it rebuilt, so not as bas as feared. Thanks Ian. Perhaps the back stories are a little exaggerated, but reality is rarely far behind. There's a lovely photo in one of the books on the DNSR which shows "the porter and his pet goat". Hi Job, one interesting thing about building non-GWR stock is that it sets the GWR itself into perspective. I'm learning a lot about where the GWR was different from other companies in wagon design, and where it was not. Always useful to broaden our horizons. Regarding dropsiders frequenting goods depots, I'd never thought about it until you mentioned the point, but I can't see any reason why not, and it could be argued the dropside allowed easier access to all the wagon's contents. Regarding dropside wagons frequenting depots, I can't see any reason why not, and it could be argued the dropside allows an easier access to all the wagon's contents. Hello Miss P. Yes I'm fairly pleased with the lettering, although strictly speaking it is a little too high: Ideally it should be contained within the plank (I believe it was 6 inches). There are several HMRS P.O. sheets, so perhaps I should clarify that the one I used was No. P4 "white shaded black 7.3mm/5.6mm/2.2mm non-condensed & condensed". I used the 2.2 mm non-condensed letters. There aren't many of these sheets around it seems, but Mainly Trains has them. Regarding the punctuation marks, according to GW Way "by 1920 the fullstops were no longer used". I don't think I've seen any of their wagons carrying the "&". According to GWW (1st ed.,p.249) the full stops were no longer used by 1920. On the following page: "by 1901 Brake Van no.9 had been re-painted ....... and the full stops in the initials were no longer employed"
Uh-oh, I had not noticed that second note about the Brake Van. The copy I have of the prototype photo is not clear enough to reveal whether there are full stops. The prototypes were introduced on the MSWJR in 1899. Photos of various MSWJR wagons introduced three years earlier in 1896 show the full stops (as did the brake van you mention). With the 1920 date mentioned in GW Way I thought I was safe in using the full stops, but maybe not. I have followed your stuff from the beginning, and all of it is excellent. Regarding foreign wagons there was a fair amount of movement of specific products, returning wagons being empty of course. So all you need is to find the product to explain the wagon. Seasonal or perishable produce was often localised, but tended to go to the big cities where it was transhipped (bananas via LNWR from Liverpool to London for instance), but machinery and hardware could come from quite a distance, and not all the named fast goods trains on the GWR went to London so stuff from Birkenhead for example could easily find its way to Farthing. I'm sure you can write the sory for each wagon you like the look of! Beware the account in GWW first edition! The section in the second edition is somewhat clearer and more detailed and was re-written by Mike Barnsley. It's clear from his account that there were a variety of liveries around 1900. He mentions second-hand vehicles delivered in 1887 with "M&SWJRY", then "M.S.W.J.R" by the mid-1890s (incidentally, some Gloucester built examples had a trailing full stop). Some "LSWR-style" opens received "M.& S.W.J.R" in 12" letters around the turn of the century. Then, "During the 1900s, a return was made to the earlier style of small letters about 6" high but with...'M S W J R' without any full stops." So, it looks like "M.S.W.J.R" is good for mid 1890s to perhaps mid-1900s and maybe a little beyond. Incidentally, Mike's partial quote about brake van No 9 is perhaps misleading in that it omits the essential difference that the lettering was about 14" high and is not the small letter, no full-stop version that came in in the 1900s, just another of several large letter variations. My apologies for the partial quote - always dangerous - though I was only sparing my typing fingers! I only intended to indicate that there was some evidence for dropping the punctuation, as early as 1901. I suspect that there was much less consistency in such matters within the smaller companies, where much of the stock was 'bought in'.